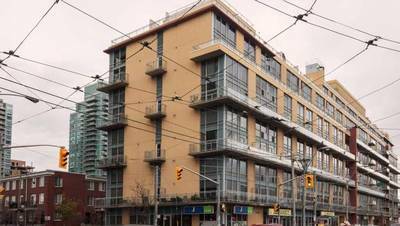 Electra Lofts only had a few units up for sale in December last year. While one model spent 70 days on the market, this two-bedroom unit sold in 18 days despite a south-facing view towards active railways. Like many units in a decade-old mid-rise, this 850-square-foot suite has a two-storey layout with exposed concrete ceilings and walls in the kitchen and an open living and dining area with 17-foot ceilings, two-storey windows and sliding balcony doors. Broadloom installed last year adds warmth to the upper bedrooms. Both have glass railings overlooking the principal room with hardwood floors, but one features a walk-in closet and the other offers a balcony. Preparing for the day is hassle-free with two full bathrooms, stacked laundry machines, new stainless steel appliances and parking. A monthly charge of $520 covers utilities and on-site fitness and party rooms. "It's beautiful. The sellers had really good style, so the photographs showed well and it was always perfect when somebody walked in," says Holly Chandler. "It's still nice and solid with concrete ceilings, so that appeals to people." This suite also provided more privacy than traditional lofts. "[The buyers] like having the bedrooms away from the main entertainment space," Ms. Chandler says."